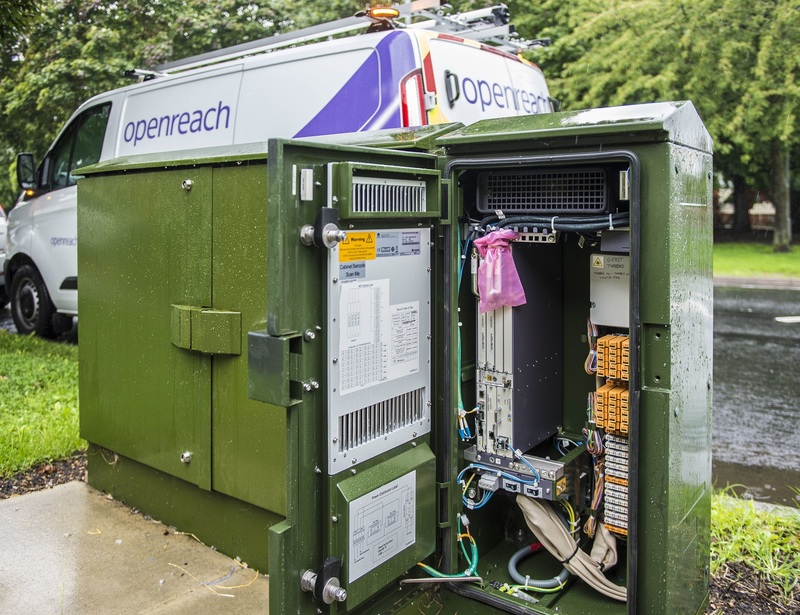 Openreach is expanding its G.fast footprint by around another one million premises as part of its eventual aim to reach 5.7 million premises with the option of ultrafast broadband from street cabinet pods. The roll-out is set to last around nine months with the 81 areas joining some other 250 areas where Openreach says it has made G.fast available. G.fast services are only sold to those within a short distance of the pod generally you need to be within 300m and the minimum speed they will sell is a connection speed of 100 Mbps, with two product speeds on sell a 160 Mbps tier and a 300 Mbps tier with fastest tier supporting upload speeds up to 50 Mbps. The G.fast footprint when combined with the Openreach FTTP footprint is officially over 1.9 million premises, our coverage tracking knows of a total of 1,769,106 ultrafast premises with G.fast accounting for 1,139,476 of these and the G.fast pods spread across some 209 exchange areas. Some of the difference versus the Openreach figures is that it takes time to spot all the changes and in some areas Openreach has cabinets marked as live but none of the wholesalers are selling the service yet, the most likely reason for this is the need to get the backhaul arrangements in place. 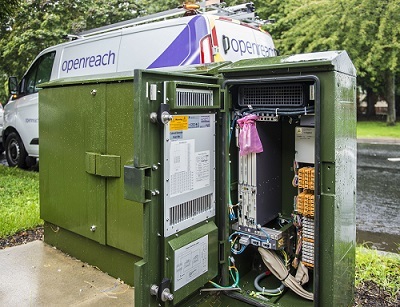 For those living in the new 81 areas mentioned we should point out that the G.fast roll-out is not to every green cabinet that has a VDSL2 twin but generally to selected areas, additionally it can be a number of months before the pods go live once added to the street cabinet. For those who were hoping for Openreach FTTP to their address, having G.fast on an exchange does not preclude some areas on an exchange getting FTTP, but what we can say is that if you end up within range of a live G.fast pod that Openreach FTTP will not be appearing for you. Update 12:10pm The number of G.fast premises we are tracking has increased to 1,145,480 since publishing the original item early on Monday morning. The two latest areas added are Byfleet and Hampton. So Openreach ultrafast footprint has now increased to 1,775,110 premises. Something isn't right there, my cab 43 on Montfort exchange (EMMONTF) is being wired up as I speak, literally there are 2 guys working wiring the new GFAST pod to the current cabs, yet the exchange isn't on the list. Leicester central is a different exchange. Unless we are part of a different rollout? I did try to find out about it but no info is available. Glad to see my exchange listed but don't think I will benefit as I am about 600m from my cabinet. In that difficult middle ground where G.Fast is no good and FTTP a long way off! I’d rather not see my exchange area. If they install G.Fast then it means FTTP is a long way off for you. Seems quite a few exchanges are having cabinets added that are not on any list from Openreach. I know of at at least three G.fast cabinets on Tayport (ESTAY), out of a possible total of four, and have spotted a couple on Dundee Steeple (ESMAI). None of them have been enabled yet as far as I can tell having gone in during August/September as best I can tell. Our road doesn't even have fiber yet. Only Virgin Media, which is fine as I get 385Mbit/20Mbit - but it limits me to ONLY using VM. If I switch to xDSL, my estimated speed is 3Mbit. Still nothing for Ayrshire, Ayr exchange for myself and a G.Fast Pod already on cabinet 26. Speeds have went from 70Mbps + in 2016 to now being on 45Mbps. There is no fault causing this speed, just degradation which is not picked up by Openreach who have me well in excess of 900m from cabinet. The fast get faster, the slow get slower. It makes no sense, especially in a postcode/street where virgin refuse to cable due to fancy roadway material costing too much to lift. VDSL2 was always going to suffer from crosstalk, hence why G.fast had vectoring as part of its standard from day one. As for G.fast on cab 26 in Ayr, if there is one it is not live. If you have something odd street covering wise, then likely all the operators will have issues with FTTP roll-outs unless down ducts already in place. Not sure these rollout announcements are too comprehensive - a whole raft of cabinets around here were installed and went active without ever appearing in one. Hence why we do all the work we do on coverage analysis, perhaps if it was not so boring we should publish the list of 216 exchanges where we've seen G.fast available from at least 1 pod. Bridgend (S. Wales) pretty much all wired up now, but not on any list yet. I must say, it's a delight to hear of people getting 300Mbps broadband here in the UK. Maybe one day our connection and that of the hundreds around us could be bumped up to 2Mbps so my wife and I can both use web browsers at the same time to look upon this new wonder of the world and bask in it's magnificence? I agree with Nobby999. Makes me laugh to see to see people complain their speeds falling from 70Mbps to 45Mbps. We barely get 5Mbps! @jazzsims So if your speed dropped from 5Mbit to 4Mbit you wouldn't complain because some people only get 1Mbit? Right? Or would you perhaps be upset because suddenly you are paying the same, or more, for a lesser service! Spot on, a fact that is ignored when the spivs start hunting their next milch-cow. what is also neglected at privatization of GPO-BT was that the Private, Profit hungry Coy had a virtual monopoly and could, and did, hike up their charges across the board for almost all of their "services". And again, OUR-BT and its predecessors had a worldwide reputation for the invention & introduction of innovative services.